(Newser) – A century later, we can now blame a mine from a German U-boat for the lone major US warship sent to the ocean's depths during World War I. The USS San Diego got there fast: The armored cruiser listed and sank within 30 minutes of an explosion off the coast of Long Island on July 19, 1918, leaving six sailors dead, per NPR. But the cause was slow to surface, though researchers at the Naval Surface Warfare Center think they've now solved the puzzle. Dives at the upside-down wreck south of Fire Island—combined with a sonar scan, computer modeling, and crew accounts—revealed that an attack from outside the ship, rather than sabotage or an accidental coal-dust explosion, was the most likely scenario. However, the damage inflicted wasn't so severe as to suggest a torpedo attack, reports Live Science. And none of the ship's 17 lookouts reported a torpedo's bubble trail. 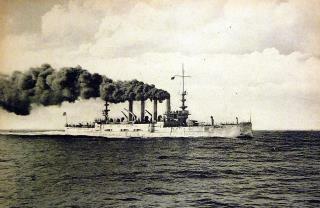 The USS San Diego wasn't the "lone" US warship sunk during WWI, not even the lone warship sunk by a U-Boat. Even if we don't consider troop transports to be "warships," there was still the USS Minnesota, a Connecticut-class battleship sunk by the U-118 on May 31, 1918. Check out the smoke from those stacks. My first childhood home had a coal fired furnace. Hard to imagine now.